Losing more than 100 pounds can lead to irreversible stretching of the skin. You've managed to reach your weight-loss goals and have been able to reduce a significant amount of excess fat. You may be excited to finally be able to show off your new look; however, if you've been left with excess hanging skin, this prospect can be intimidating. Fortunately, that lack of tone can usually be reversed through a program of exercise. Before you know it, you'll be proudly sporting a fabulous new you. Loose skin on the arms after a large weight loss tends to occur in the upper area of your arms. The underlying muscles known as your triceps, explains the American Council on Fitness in their online publication "ACE-Sponsored Research: Best Triceps Exercises," respond best to triangle pushups. In addition, exercises such as dumbbell kickbacks can tone the muscles at the underside of your arms. Curling movements performed while holding a barbell or dumbbell help tone your biceps muscles that are located opposite the triceps. As your triceps and biceps become more toned, they also grow and pull the loose skin taught. Exercises such as lunges, squats, leg extensions and leg presses can tone the quadriceps muscles located in the front of each thigh and the hamstrings on the rear. Loose skin may appear, explains the University of Pittsburgh Medical Center in their online brochure, in the inner and outer thigh area. Abduction and adduction machines, found at your local gym, can tone the inner and outer thighs. A variety of cardiovascular exercises such as brisk walking, cycling and swimming can help tone the leg muscles while also supporting overall health. The glutes or buttocks muscles are the largest in your body but are frequently neglected because cardiovascular exercise tends to strengthen them. Despite this, toning the buttocks muscles can increase their size, displacing loose skin and giving a gentle lift to the skin of the legs as well. Toning your buttocks muscles, explains ACE Fitness in their online publication "Glutes To The Max," is best accomplished by performing exercises such as hip extensions, step-ups and lunges. Toning your core muscles, found primarily in your abdomen, won't make them grow much larger but it can make them more defined. Additionally, working on the abdominal muscles can help stabilize your posture as you perform exercises to tone other muscle groups. This can both prevent injury and maximize the effectiveness of the workout. Popular exercises such as crunches, machine pullovers and pull ups engage your core muscles, encouraging the loss of excess fat while also defining the underlying muscles. Your skin has a limit to how much it can recover in elasticity if you've lost a large amount of weight. If you've lost more than 100 pounds, Surgical Associates at Virginia Hospital Center explains in their online publication "Will I have Loose Excess Skin After Weight Loss," you're likely to be left with some excess skin that may require surgical removal. In addition, the amount of skin you have sagging can be affected by characteristics such as age that are outside of your control. Excess skin from large weight loss doesn't usually pose a threat to your health, explains Surgical Associates, but it can affect your self-esteem and confidence. Surgical Associates at Virginia Hospital Center: Will I Have Loose Excess Skin After Weight Loss? Len Kravitz, Ph.D: University of New Mexico: How Do Muscles Grow? Maura Banar has been a professional writer since 2001 and is a psychotherapist. Her work has appeared in "Imagination, Cognition and Personality" and "Dreaming: The Journal of the International Association for the Study of Dreams." Banar received her Bachelor of Arts in psychology from Buffalo State College and her Master of Arts in mental health counseling from Medaille College. 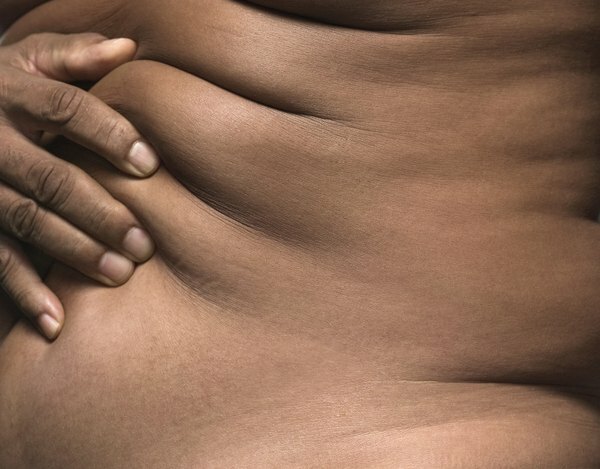 Does Toning Your Stomach Reduce the Look of Stretchmarks? Can Vitamins Tighten Stomach Skin? Can Crunches Make Your Waist Bigger?